“Data – I mean the right data – is hard to find”. This observation comes from a Lean 6Sigma Manager in the Food Industry. Of course, a Lean 6Sigma manager understands more than others the value of data. Of the right data, he emphasizes. Indeed, it appears that food manufacturers often seem not to have the right data in place to solve production and quality issues. What are the reasons for a Rejected batch? You need these data to gain insights. Insights, for instance, to answer questions about the capacity to produce a better quality or to raise output, or to find out what went wrong with a rejected production batch. After all, a high First Time Right percentage for food production still appears hard to achieve. We want to prevent a future batch from being rejected. And it would help if we could have an early detection of problems during the production process, instead of a correction of problems after they have occurred. The latter is the traditional method of mainly relying on quality inspection after production. A rejected batch is an ideal opportunity to find out where things go wrong. To find out what the reasons are, you have to collect all sorts of information about this rejected batch. The reasons behind the non-quality can be found in raw materials characteristics or deviations in the production process. This involves information from a variety of sources: the raw material quality control test results, conditions of the storage tanks, the process conditions, in-process quality control test results, operator observations, etc. The important question now is: How easy is it to bring together and synchronize the abovementioned information providing a complete batch history? You already guessed: IT’S NOT! Hence, the lamentation of the Lean6Sigma manager I quoted earlier that the right data is hard to find. It’s often a very time-consuming and laborious job, and generally you won’t obtain all information you need. Also, you can have serious doubts on the reliability of part of the data. There are roughly two different approaches for companies to deal with this. The first is to accept that live does not always provide you with everything you want, so you simply make the best of it: the trial-and-error approach to prevent rejected batches may generate some good results. Especially when this is done with a thorough understanding of the production process. This is the conventional proven method for companies that has delivered results over the last 200 years. So, why change? Another approach is to consciously work towards a plant information system. 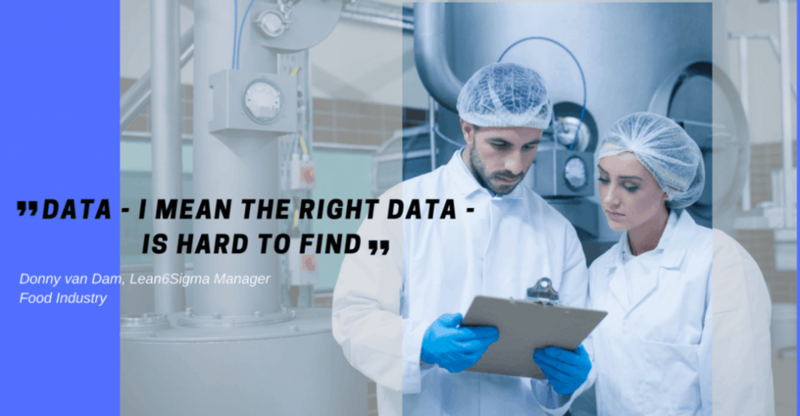 This should eventually include all relevant information from the production process, including product quality inspection results, cleaning operations, etc. This may concern manually recorded data, like quality inspection results or operator checklists and observations. It should also include automatic data collection from production control systems (SCADA: start/stop time-stamps, pressure, temperatures, valve positions), (in-line) inspection equipment, (remote) sensors, scales, etc. This well-structured plant database needs to be completed with a visualization and reporting tool, in that all those involved can retrieve their information without the help of an IT-expert. This is a solid foundation for a smart plant information system: Rejected batch? Can we improve quality? Can we increase output? Bring on the questions, because now we have data! By now we have reached our ultimate goal: Not only a professional plant information system, but also fact-based decision-making. This is what I call the SMART way to go! PreviousPrevious post:Vacature Implementatie Consultants Industrie 4.0NextNext post:Reporting- and analysis-tools for Food Factories: why wait?